You don’t have to google too deeply to discover reports of black mold; Stachybotrys chartarum (Stachybotrys atra); on the campus of Maharishi University of Management (MUM). As I’ve cited in prior entries, I’m not an Ivy League scholar like some of the professors here — Fairfield, IA USA — at the university. Nor am I a chemist or biologist. I don’t make a habit of maintaining a supply of petri dishes or agar required for the inoculation and culturing of molds or bacteria. Moreover, I don’t harbor an electron microscope required for the necessary identification and subsequent analysis of microbiological phenomenon. This said, I did find it hard to ignore the the dark green-ish black soot-like deposits residing on the vent covers of the LIB-SCI building’s ventilation system. Further research suggests the building’s construction prior to 1960, though I lack the credentials to make this assessment with any degree of certainty. This unfortunate condition may include other buildings such as the female dormitory located just south of the LIB-SCI building. In the event my assessment is accurate, it may suggest that a possibility exists that the building may harbor asbestos. I wouldn’t normally be such a hard critic publicly, to this extent, but the universities pattern of passivity has me overly cautious. Moreover, in conjunction with the ‘block system’, my exposure to these conditions aren’t an every-once-in-a-while situation; exposure occurs six(6) of seven(7) days per week over the duration of four(4) weeks per course. Other buildings on the campus echo similar attributes in respect to age, remnants of the original Parsons College from whom Maharishi University of Management purchased the campus in 1972 at an attractive $2.5M USD. Black mold is rather fond of moist areas which lack fundamental ventilation. I say this in respect to the private music studios, each approximately 750 cubic feet in volume, harbored in the building’s lower level. The antiquated soundproofing is falling off the walls, the ‘drop ceiling’ frame and tiles have expanded, with perhaps black mold on the vent covers — perhaps a result of the dark room in conjunction with humidity fluctuations. Some pianos are out of tune, they may not even hold tune. This may be due to age, or frequent usage, but might I suggest the possibility that the moisture (humidity) in environment may lead to warping of the tuneboard’s arch (crown) of the piano, causing it to detune — not to confuse simultaneous correlation with causality. 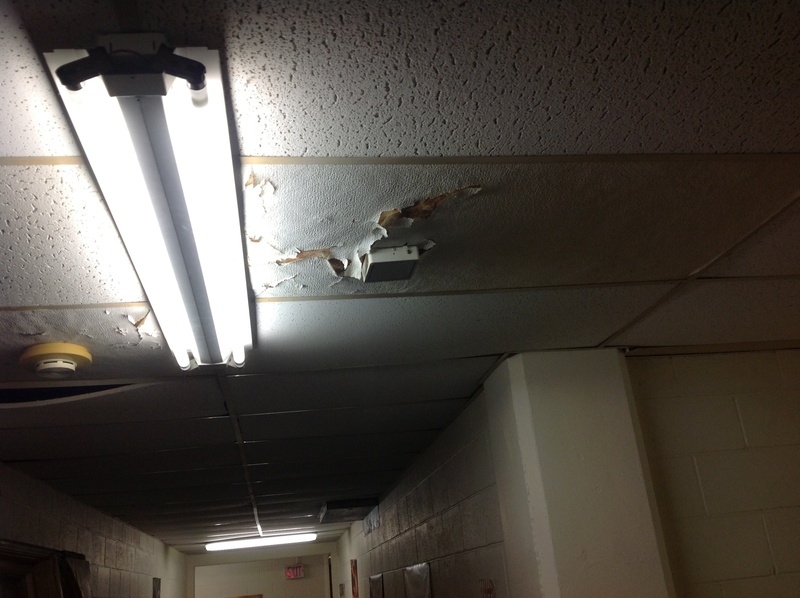 Examination of the ceiling tiles in the hallways of the building reveal that maintenance, a major component of ‘management’, is lacking. Even if I’m mistaken, these conditions are hardly conducive to quality education. Lacking the vastu-based architecture championed by the university, it’s somewhat logical that plans of rebuilding or relocation may be in place — I attribute the cosmetic neglect of the building to fiscally driven complacency, a means to conserve resources for a new vastu-style building rather than investing in repair. The existence of these conditions might be the result of various grandfather clauses associated with older buildings, allowing the owner of the property to escape accountability. Moreover, because the vastu-style buildings are so obviously associated with the school, it’s not overtly obvious that these older buildings are part of the university — until you find yourself attending class within. This is not to say that mold spores don’t exist in the newer buildings. Lastly, west-facing doors of the building are restricted from use so as to comply with vastu-principles. Again, the university is comprised of individuals who care about the well-being of others, but have limited resources to maintain the overall standard of their well intentioned vision. The dangers and risks associated with Black Mold or Asbestos can range from mild to serious, if you see anything that remotely looks like a mold of any sort consider capturing the moment in a digital photo with your phone or tablet and email it to officials such as the Centers for Disease Control (CDC) or local professionals to be certain. Ceiling tiles quite possibly exhibiting signs of moisture damage. 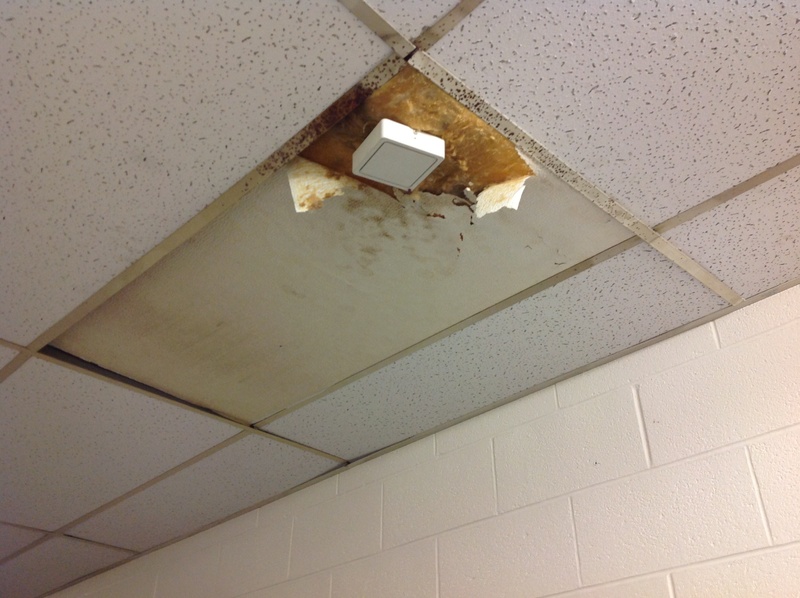 Ceiling tile exhibiting signs of expansion possibly due to moisture fluctuations, possible black mold in tow.